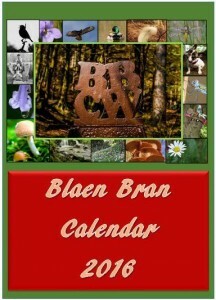 If you would like a 2016 Blaen Bran calendar with some lovely photos there are still some left. Obviously we dont really want to bin them and would appreciate some advertising locally, so if you are interested in having one let us know here. A donation of your choosing towards the woodland would be appreciated, but is not necessary if you can collect it from Cwmbran. All proceeds will go towards projects in our much loved woodland.